According to reports, Ajay Devgn will launch the theatrical trailer of his next film De De Pyaar De on his 50th birthday. The superstar, who has been working consistently in films for close to three decades now, turns 50 on 2nd April. If reports are to be believed, Devgn wanted to treat his fans with the trailer for his forthcoming film on his birthday. The makers have agreed to his request and the preparation for a grand launch in Mumbai has begun. Besides Ajay Devgn, De De Pyaar De also stars Tabu and Rakul Preet Singh in principal roles. 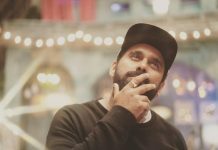 The film is directed by Akiv Ali who is making his directorial debut after establishing himself as one of the most sought-after editors in the industry. The movie, which began production last year, is being produced by Bhushan Kumar and Luv Ranjan under the banners of T-Series Films and Luv Films respectively. The entire cast and crew, along with some fans of superstar Ajay Devgn, will be present at the trailer launch of the film on April 2. De De Pyaar De is set to release on 17th May, 2019.